i'm a coder/immediate re who just bought a EOS 1300D and would like to port magic lantern to it. I've read around the forum and the first step for porting is dumping the firmware. 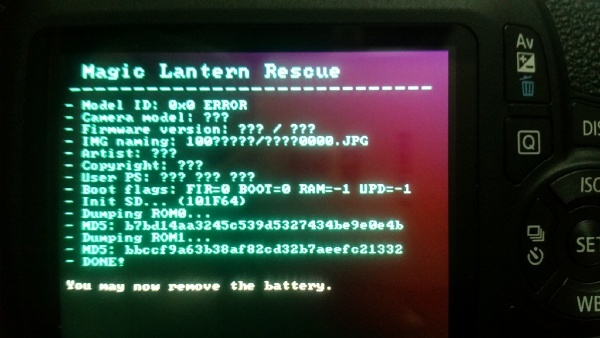 I've tried the portable rom dumper but unfortunately nothing happens(black screen, camera needs to be reset using the battery). Another way i've seen is using specifically crafted .fir files. What do i need to provide to get a .fir dumper for this camera from you? I've used this one (http://www.magiclantern.fm/forum/index.php?topic=16534.0) but i guess it's only for cameras where ML is already installed? You mean, autoexec.bin? How did you manage to lock up the camera without enabling the boot flag first?! If successful, please send me the ROM by PM. The info looks fairly similar to digic 4; the two 32MB ROMs are a bit unusual. RAM seems to be 256M. - if you are lucky, you might even see Canon GUI (but don't get your hopes too high on this one). Unfortunately it does not seem to dump anything. Nothing changed on the SD Card. It looks like it freezes after saying "Dumping ROM0..." (i reset the camera after 1 hour). You may have better luck with a smaller card, or maybe even with a card formatted at a smaller capacity. For me, this tool works best on an old 256 MB card. Thanks, resizing the sd card to 256MB worked. - The two ROMs at F8000000 and FE000000 are identical, so it probably has a ROM chip at F8000000, mirrored as usual until FFFFFFFF (4 copies x 32MB). We call this one ROM1. - There seems to be another 32MB ROM chip at F0000000 (ROM0). - Bootloader appears to be at F8010000, but the first instruction jumps to FFFF0040. Code at F8010040 looks valid. The ARM946 can start from either 0 (unlikely, that's the RAM) or FFFF0000 (HIVECS configuration). However, the ROM dump after FFFF0000 is... empty! After this, running in QEMU is more or less straightforward, with a small reverse engineering puzzle to solve. It took 10min to dump. There's something I can't understand very well. How to patch the dump? I've managed to search for it but I can't find anything useful. Dumped ROM - Success. Did it twice and compared, good dumps I assume as they were identical. Patched ROM as per above instructions. Compiled QEMU and added Machine Rego in eos.c for the 1300D. HOWEVER. I dont actually have any clue what the register address in the source is supposed to be targeting. I set it to FF801000 which is noted above as being the bootloader position, and got some minor output suggesting some code was executed, but it stalled after a few shifts, so im thinking im in the wrong boot position. But honestly, I only have a small idea of what im doing here, just an honest interest in figuring it out. Any suggestions from the almightly userbase? I tried to figure out the offset from the ROM, and came up with 0xF8008000 based on the above patch to ROM1. Lo an behold there was some execution and what looks like now idle output on the console. No picture though. next step I guess is to attach gdb and try and figure out whats actually going on? Also to figure out what the hell im doing. EDIT2: OK So it helps if im running qemu using the patches in the current branch, not some old stuff. Whoops. OK, having checked out the correct branch for the current QEMU build, ive created a machine profile for the 1300D using values provided above for RAM size, ROM size and locations etc. FIXME: no MPU spells for 1300D. System & Display Check & Adjustment program has started. Ill happily admit though that at this point im fairly lost, but ill do some reading to try and keep moving. Looks good. Next step is to prevent the adjustment menu from coming up (and launch the main firmware instead). You can also use -d io (or -d exec,int,io) to get some more info about what happens, and you may find it helpful following the code branches in IDA (e.g. press space in the disassembly tab). Additionally, -singlestep is useful for getting correct program counters in the io logs (otherwise, you'll often get the start of a small function, rather than the exact address where the MMIO access happens). You'll have to configure the emulator in a way that "forces" the boot code to pick the FROMUTILITY path, instead of the System adjustment menu. The place where the code path should be changed is not the same place where it locks up (that's a bit tricky). However, all the functionality of the "guest" program (here, the firmware) can be changed from MMIO registers and/or triggering an interrupt (you only need the former method here). MMIO registers and hardware interrupts are the only external interfaces of this CPU to other devices, as far as I could tell. MMIO registers cover GPIOs, interrupt controller(s? ), DMA controllers, communication with other CPU cores, image processing modules, I2C, SPI, UART and so on. In our implementation, all of them are covered in the eos_handle_* functions (which looks a bit different from other QEMU code, as they were ported from another emulator, back in the old days). An interrupt can be triggered whenever an external device does something interesting (here's an example). Thanks a1ex! Nice to meet you btw. That makes sense. Ill have a look through the code at how such a boot shunt (term?) is achieved to skip Adjustment on another device so I can see what im looking at. Nitty gritty time. The second, which the GPIO handler has annotated as maybe being SD Detect for the 70D and 6D, proved more valuable. Replacing the output of that overwrite with a 0 value skipped the SDAC and moved ahead. Whoopie! The process seems to now move a lot further ahead, and positively is now halting with an Assert. So! Its time for me to setup IDA i think. Plus updated the notes document to include the modified eos.c code. Not sure what's causing the assert (didn't look much into it yet, other than noticing it depends on the output values given by sub_27C4, which is copied to RAM right before cstart - a process done on other DIGIC 5 and 6 cameras). The 1300D appears to have a few bits from the newer codebases backported on DIGIC 4.
followed by F9 in IDA. It also helps extracting the memory blocks copied to RAM and loading them in IDA at the copied location as additional binary files. The functions copied there will be executed from RAM. Was there a good forum post or wiki article on setting up IDA? I havent had the opportunity to use it before, and so far ive not found anything on setup, or which version to use etc etc. Ah ok, the eval version of IDA Pro doesnt support GDB remote connections. Not having much luck with IDA, very new to me, but learnings 90% of the fun. On the flip side, I did try running the 1300D using the boot flag and got the portable display test and recovery screen. From above it seems thats expected and a good sign, so plus 1 I guess . 0xF8000000 is the address used for boot flags. This suggests the 3 output values are probably read from there. The next checks (before the assert) appear to accept the following values for out1-3: C2, 25, 39 or 20 BB 19 or 01 02 19 (hex). Each of these sequences is handled with a different subroutine: 2938 / 2B0C / 2CE4; they all allocate memory, fill in some round values and call FE2B486C (which is complicated). Now, our function returns 06 00 00 (instead of one of the accepted sequences). Where does that come from?! Brilliant, I actually understood most of that. You wouldnt teach Comp-Sci would you? Ill start looking around at that point. Maybe attack it the rock and hammer method and throw values at it and see what happens. right, I see what you mean about 0xF8000000 changing unexpectedly. And I figured out how to poke registers so thats another step down. Eyes are crossing now, more tomorrow! My hypothesis is that it might be trying to get some sort of manufacturer ID of the flash ROM chip. [FlashIF] at 0x00102164:001021B8 [0xC0000000] -> 0x0 : ??? [FlashIF] at 0x0010216C:001021B8 [0xC0000000] <- 0x1000000 : ??? This looks similar (but not identical) to the Block Erase sequence. Probably the chip is some related model (not exactly the one listed on the wiki page). So, my best guess is that we should model this copy of the ROM as I/O memory and fake the data somehow. Note: in QEMU, it's generally not possible to log every single memory access, unless that memory block is configured as I/O. However, memory implemented as I/O cannot contain executable code (so we have to choose one). Side note: I'm currently looking at Panda (a fork of QEMU), which promises the ability to log any memory access, and a lot more useful analyses (look at plugins in their manual, for example). So then assuming following your hypothesis, we should see a somewhat related compare between the K404 Ready and the Asset. Also I might try and find some high-res scans of the 1300D motherboard or similar to identify the exact Flash used. All the other IC's are either too small to read on the medium res photo, or covered by a shield, sadly the Flash appears it might be included, but that MIGHT be the LCD Processor given its placement. Going to dig up the datasheet on the CPU to find out a bit more.